This sautéed mushrooms with cauliflower puree is my new favourite thing in all the world to eat other than my Nana’s caramel kisses. 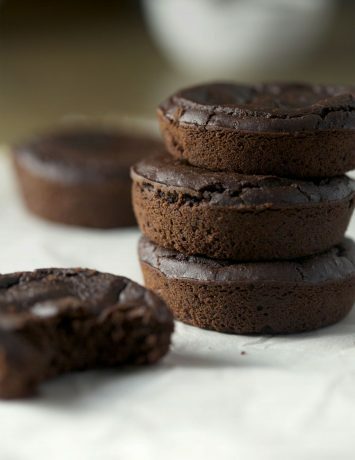 And perhaps the slightly salty chocolate brownies…those things are awesome. But they are sweets and don’t count because if you’ve been here before you know how I feel about sweets. 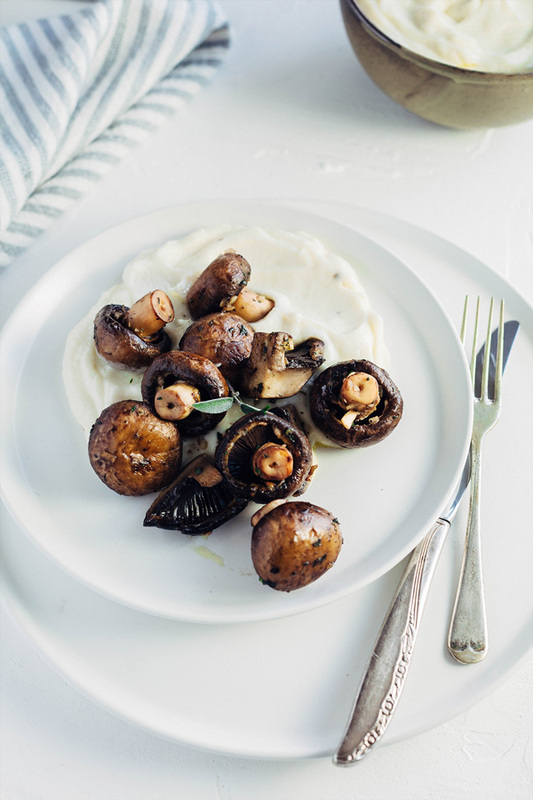 This sautéed mushrooms with cauliflower puree is my new favourite savoury thing to eat. 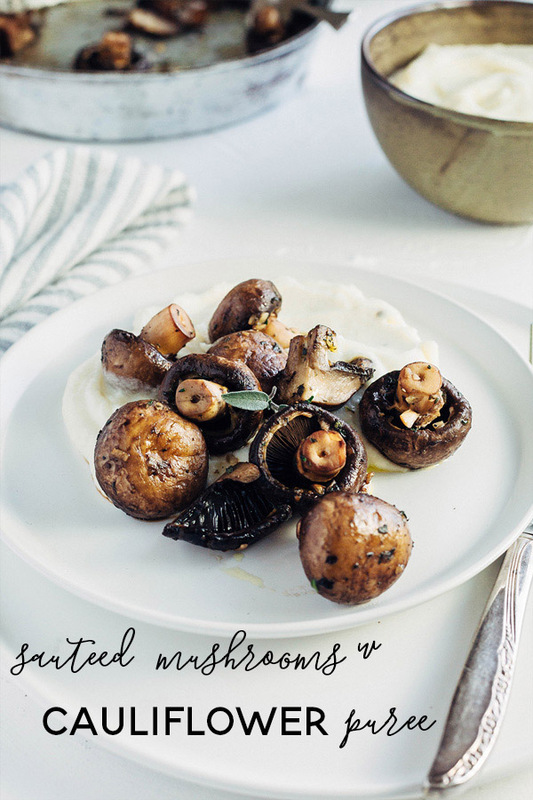 Mushrooms sautéed in garlic, thyme, and sage nestled in a silky smooth pillow of slightly buttery, slighty salty cauliflower puree. Bliss. I will be brief tonight, friends. I feel the need to get right to the point and the point is cauliflower puree. I love cauliflower in all its bumpy amazingness but I think this cauliflower puree has left me starry eyed. Since this recipe I find myself spending way too long in the vegetable section of our local store staring wistfully at the pale, fat bulby flowers. What else can I have with it? Is it wrong to eat an entire head of cauliflower by yourself? What if I didn’t tell anyone? It’s like the tree in the woods, right? 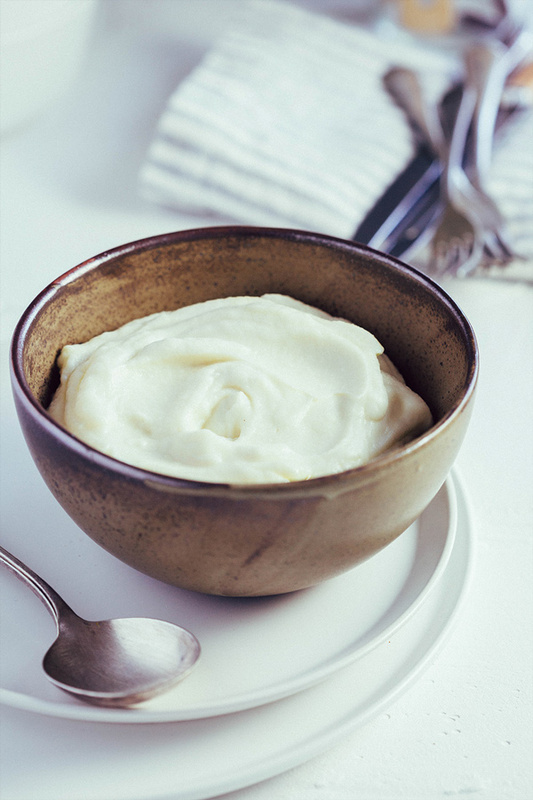 This cauliflower puree is silky, smooth and buttery but without all the hoopla that seems to go in to making perfect mash potatoes. I have always been a roast spud girl myself so the idea of all that cream and butter going in to my potatoes to make them perfect was lost on me. But now, I get it. This puree is my mashed spud. It is my new comfort food when I don’t need comforting. And I used one tablespoon of butter for the whole head. One. 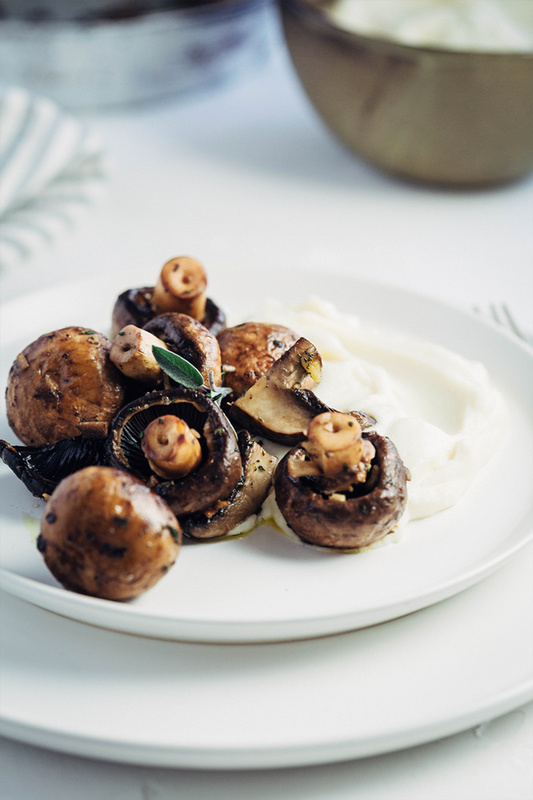 Mushrooms sautéed in garlic, thyme, and sage nestled in a silky smooth pillow of slightly buttery, slighty salty cauliflower puree. Put a lid over the pan and cook the cauliflower on low to medium heat for 10 minutes or until a knife can easily pierce the vegetable. Carefully strain the cauliflower in a colander and leave to steam dry for around 5 minutes. In a blender, add the almond (first) followed by the cooked cauliflower, butter, olive oil and a good pinch of sea salt. Blend until smooth and silky. Leave the lid on. Cut larger mushrooms in to chunks leaving the smaller ones whole. In a large sautée pan on medium heat, melt the butter. Add the garlic and cook for around 1 minute. Add the chopped thyme and sage. Add the mushrooms and the olive oil. 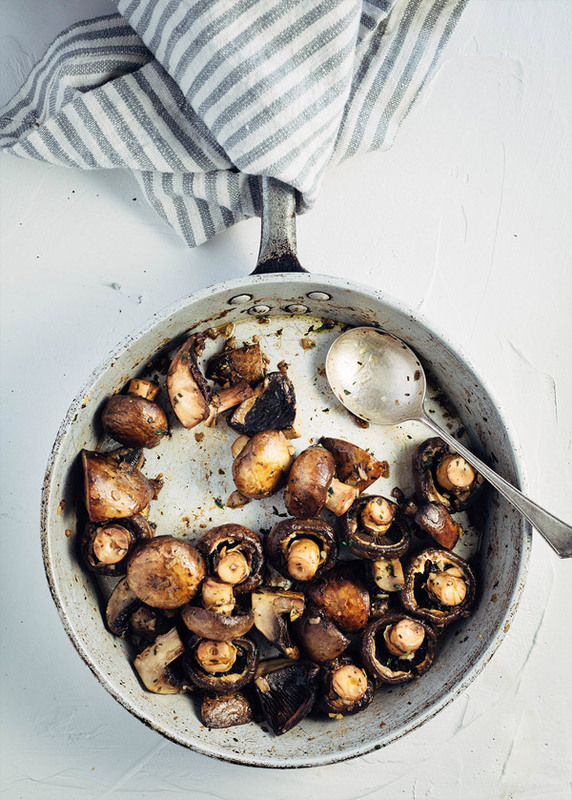 Season with a pinch of sea salt and sautée until the mushrooms are cooked. Add the red wine vinegar and toss through. Spoon several spoons of the cauliflower mash (around 1/2 cup) on to a plate and layer with mixed mushrooms. Serve with a salad or fresh bread.